Learning the lyrics to Chinese songs is a really fun way to learn new words and phrases in Chinese. It’s a great window into culture, too, to hear the poetic way sentiments are expressed in songs. 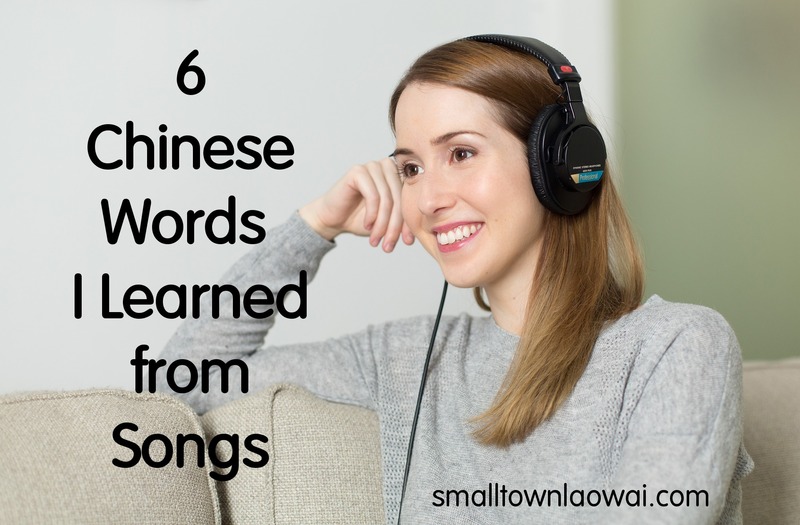 From the time I started learning Mandarin until now, I can remember many times when learning the lyrics to a new song taught me at least one new vocabulary word. Here are six words/phrases that I can remember having to learn in order to understand the songs I was trying to sing along to. Move over Taylor Swift (and the teardrops on your guitar), Superstar by S.H.E. is just about the most melodramatic pop love song I’ve ever heard. The lyrics express perhaps an unhealthy obsession with the gentleman in question with sentiments such as “I have no time to think about myself, I only feel what you feel” and “You rule, I worship [you], there’s no other way” and, after it’s clear the guy is leaving her, “If I forget myself, please help me remember me.” You get the picture. Somewhere in there, the singer says that the guy’s hand is not just a hand but her whole universe, which is how I came to learn yùzhòu. I don’t think I would have learned this in a textbook. It just doesn’t seem like the type of thing anyone would think to include in formal lessons. However, after learning this phrase while singing along to this Taiwanese hit, I kept hearing people say it in everyday contexts. This is a pretty interesting little verb that can only mean a women marrying a man. It’s literally “given in marriage to,” which reminds me of the phrase traditionally used in American wedding ceremonies, “who gives this woman to be married?” However, in this duet, both the man and woman sing “nǐ yào jià gěi wǒ.” I guess it would have sounded too weird to have them singing different phrases at the same time? This is one of my absolute favorite pop songs in Chinese. It’s a beautiful song and a great showcase for Han Hong’s incredible voice. There are actually a lot of great vocabulary items in this song, but sūxǐng is the one I remember having to look up. I had only learned xǐng ‘wake up’ before. Little Apple was a runaway hit and you can’t help but sing along to this ultra-catchy tune. You will probably also start dancing along, and I fully support you if that happens. Xīn wō literally means “heart nest” and I think it’s quite a romantic way of describing your heart of hearts. I am so amazed by (and a little jealous of) how much you know! I’m going to find those songs on QQ right now (except for Xiao Pingguo, which will be the end of me if I have to hear it in my house one more time). Since I don’t know where to get in touch with you but here, I just wanted to tell you about healthtap.com. It seems like a really crucial resource for expats in China, especially in smaller provinces like ours. We’ve had three different series sicknesses go through our family in the last two weeks, and I discovered them and they saved us. It’s the thing I was wishing for when we moved here–just any doctor who’d please give me specific treatment advice, understanding that I couldn’t come in for an appointment and I wouldn’t sue them for being specific. I ended up with a $100 subscription for this month because I’ve consulted probably 10 different doctors on there, but you can have just one text or video consultation for $25, plus a follow up with the same doctor. I found some really excellent doctors and some just so-so, but I have added the fantastic, really specific and knowledgeable ones to my “personal care team” for future reference, (I guess it’s why I liked the month subscription this time around, so I could get multiple second (third) opinions.) I guess I sound like I’m selling it, but I can’t help it. I can’t stop thinking how they saved me after going to the Chinese hospital who never heard of a rapid strep test and wouldn’t have results for 3 days, and then had me hold up a lighter while they ran the stick end of my throat swab over it and inserted it back into it’s container. I feel like every foreigner in China needs this. My friend had what we thought was HFMD and 3 different hospitals here thought was either nothing or an allergic reaction, one put her in a CT scan for it, and the last one gave her diabetes medication! It’s scary! It took a lot of explaining and detective work, but it turns out she probably has scarlet fever, thanks to healthtap, I mean, thanks to them finding it out, not giving it to her, and she is the source of our strep infections. All that to say, it’s so much better than scary Chinese hospitals, and I thought of you over there in Yunnan when I was rejoicing in my luck at having stumbled upon them. Wow, that sounds like a really useful service! I can easily think of many times we could have used something like that for diagnosing health issues. Thanks so much for sharing that tip! P.S. Don’t feel bad about avoiding Little Apple. We haven’t heard it too much, but I can imagine it’s been played ad nauseum all over the country. PS: How are the puppies?! They are great! I have been meaning to do another update post on them. They are plump, fluffy, adorable, and (perhaps most importantly) we’ve found homes for all of them! Good writing! It is not easy to learn Chinese from listening Chinese songs, just like not easy learning English from listening English songs, but it seems you are doing well. By the way, the pinyin for 宇宙 is YǚZhòu (it is ǚ, not ǔ), and 不下去is búxiàqǜ(the first character is the second tone, not the fourth tone, and the last character is ǜ, not ù). In pinyin, Y, Q/q, J/j, X/x is followed by ü, not u. Thanks very much, Jeffrey! Learning from songs is pretty fun. 1) The ü is only written where it contrasts with u. So, we have nu and nü; lu and lü because both vowels are possible after n and l. But since it’s not possible to have a ü after j, x, q, y, the vowel is written u and everyone just knows to pronounce it ü. 2) I thought written tones do NOT reflect tone sandhi. For example, 没有 is written měiyǒu even though it’s pronounced méiyǒu. What’s written is the underlying tone, not the surface tone. However, it’s been years since I studied the rules of pinyin, so perhaps I’m remembering incorrectly. Let me know. Thanks again! I enjoy reading your blog and please keep writing.